Steven Gross says he has seen enough car crashes and traffic violations to last him a lifetime. As an avid cyclist for 30 years and an accomplished professional photographer who sometimes works outdoors, Gross regularly witnesses cars driving into crosswalks when pedestrians have the right way, cars parked in bike lanes, cyclists getting doored and other types of recklessness and negligence on the part of drivers. But two incidents in particular hit too close to home for him. His son Ethan, 16, was struck twice by negligent motorists who managed to get a slap on the wrist for their reckless driving. Ethan was only 5 years old when a car hit him as he was crossing the street. Gross, his wife, Ethan and his other son, Henry, who was 7 years old at the time, were walking to a restaurant for dinner when they stopped at a crosswalk in their Lincoln Square neighborhood. When the light indicated that they were permitted to walk across the street, Ethan bolted into the crosswalk. That’s when a jeep drove into the crosswalk and hit him. Ethan slid under the car and a rear wheel ran over his legs. The paramedics said Ethan luckily didn’t sustain any injuries whatsoever. So the family went to dinner that night as planned. In the meantime, the driver was ticketed and fined. 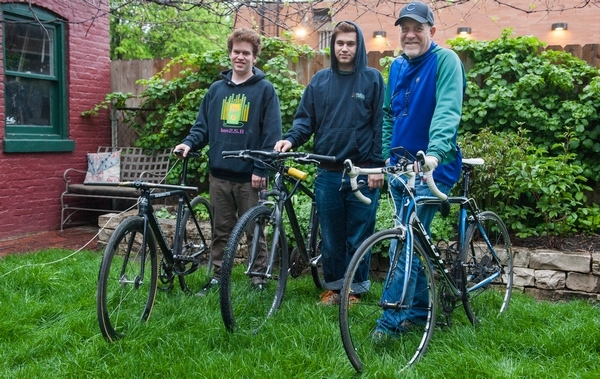 Ethan was hit a second time in July 2015 while he was riding his bike to Grant Park to get to his job with After School Matters, a nonprofit that provides after-school and summer programs for teenagers. As he crossed the street at East Jackson and South Lake Shore Drive, a cab decided to circumvent the stopped cars at the red light and speed down a right-turn only lane. The cab driver struck Ethan and his bicycle. Ethan was rushed to Lurie Children’s Hospital, where a doctor examined him and determined he did not suffer any injuries from the crash. “Yet another miracle for Ethan,” Gross says. In traffic court, the cab driver was found guilty and fined. This time Gross sued the cab company for the crash. He recently received a modest settlement that provided compensation for Ethan’s medical expenses and his damaged bicycle. Neither of these crashes have deterred Ethan and his brother from bicycling around the city. They are just more careful now than ever before, Gross says. They take precautions like riding on quiet residential roads and making sure they keep an eye out for drivers in parked cars to avoid doorings. Gross says that both of these car crashes as well others around the city are preventable. He believes the city needs to better enforce traffic regulations, particularly for crosswalks. In addition, Gross hopes the new Vision Zero Chicago plan, which seeks to eliminate all traffic fatalities and injuries in the city by 2026, will include educating all residents on traffic laws and how to navigate the streets safely. He also wants Vision Zero Chicago to implement stiffer penalties for motorists who injure or kill pedestrians and cyclists with their vehicles. If you’ve been in crash while biking or walking, you should call our Crash Support Hotline to get guidance on important actions to take. Photo courtesy of Steven Gross. From left: Ethan, 16, Henry, 18 and Steven.